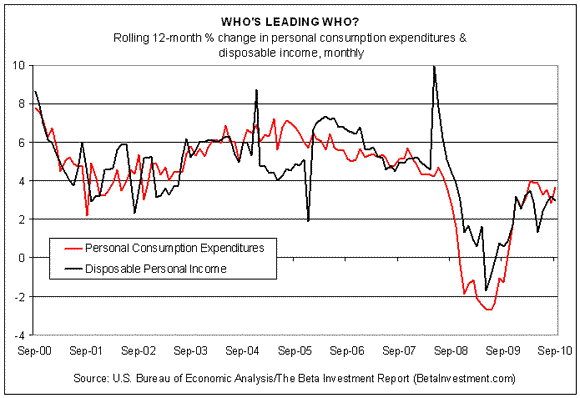 Disposable personal income (DPI) slipped last month while personal consumption expenditures (PCE) rose, the U.S. Bureau of Economic Analysis reports. The mixed profile for September isn’t surprising these days, although it does offer one more piece of statistical evidence for keeping optimism in check about the near-term prospects for economic growth. The 0.2% drop in personal income for September is the first monthly retreat in a year. Disposable income, by contrast, rose last month for the third time in a row. Measured by rolling 12-month percentage change, both income and spending remain firmly in the black, as our chart below shows. That’s a reminder that economic recovery, while weak, is likely to continue forging ahead at the margins. But the macro revival is precarious, and today’s update on DPI and PCE don’t offer much reason to think differently. The optimists will be cheered by the fact that consumption was generally higher last month. For the moment, the fear is overblown that Joe Sixpack is set to dive into a bold new lifestyle of thrift and throw the economy into a new recession. Durable and nondurable goods purchases, as well as services, posted higher consumption figures in September. 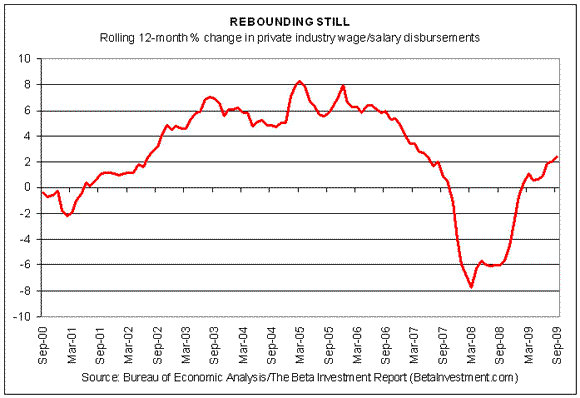 Meanwhile, the broad trend in private wages remains positive. On a year-over-year basis, paychecks in the private sector rose 2.4% for the 12-months through September. As the second chart below shows, that’s roughly a return to levels that prevailed before the recession and financial crisis hit in 2008. This critical measure, in short, continues to climb. That’s good news, and it’s one reason why there’s been an economic rebound from the depths of the Great Recession, even if doesn’t feel like one on Main Street. But if you’re looking for reasons to stay cautious, you don’t have to look very far these days. Private wage growth is still positive, but the trend is wobbly when looking at the monthly readings. Indeed, September’s private sector wages increased by the thinnest of margins. What’s more, monthly changes in private wages, while mostly positive this year, remain stuck in a low range that hovers just above zero. It all comes back to the single-biggest weight on the economic recovery: jobs, or the lack thereof. The labor market is minting new jobs on a net basis, but at a pace that’s unusually spare. Private sector payrolls have been rising on a net basis in each and every month this year, but the gains have been low and the trend has been slipping, as last month’s update reminds. Will this Friday’s payroll report for October deliver more encouraging news? Maybe, or so one could reason after last week’s update on initial jobless claims. As we reported last Thursday, new filings for jobless benefits dipped to their lowest level since July for the week ending October 23. Is that a sign that the labor market’s about to enjoy a new round of improvement? Or is it just another bit of misleading statistical noise? Too soon to say. Meanwhile, the consensus forecast among economists calls for more of the same: a sluggish recovery in the labor market. Dismal scientists predict another modest net rise in private nonfarm payolls for October, according to Briefing.com. At this stage of the economic cycle, there’s only one thing that’s going to convince the crowd that the economy’s shifting to a higher gear of growth: cold, hard numbers. We’re now in the show-me-the-money stage of economic reports. Hope is nice, but it just won’t suffice any longer. Until and if we see materially better numbers, the path of least resistance is one of expecting more of the same. Yes, there’s an economic recovery underway, and it’s enough to keep us out of a new recession, at least for the foreseeable future. But that’s about as good as it gets these days for peering into the future. And soon, perhaps sooner than we think, even that won’t be enough.